In this article you will find a sample self-assessment rubric showing the connection between the PYP attitudes and action. Recently a parent asked me about assessment in our school. It can be difficult for parents to understand the difference between PYP assessment and the test based systems we grew up in. I explained about project-based learning, Understanding by Design as well as the standardized assessments we use; however, I shared a secret with her. I told her that the highest level of assessment we have is called action. According to Making the PYP happen (2009, page 25), “An explicit expectation of the PYP is that successful inquiry will lead to responsible action”. It goes on to state that, “Effective action does not need to be grandiose. On the contrary, it begins at the most immediate and basic level: with the self; within the family; within the classroom, the hallways and the playground.” In this blog post I would like to share how I have used our attitudes to assess action at “the basic level: with the self”. Development of the PYP attitudes is an excellent way to assess action in young learners. We teach about having a growth mind-set at our school and encourage our students to be honest in their self-assessments and reflections. We usually teach two or three attitudes in each of our units. An excellent way to assess these attitudes is through a series of self-reflections. To do this I create a blank rubric like the one shown below and after ensuring the students understand the meaning of the attitude, they reflect and self-assess their current level. This particular sample in the rubric above really hit home for me the connection between the PYP attitudes and action. 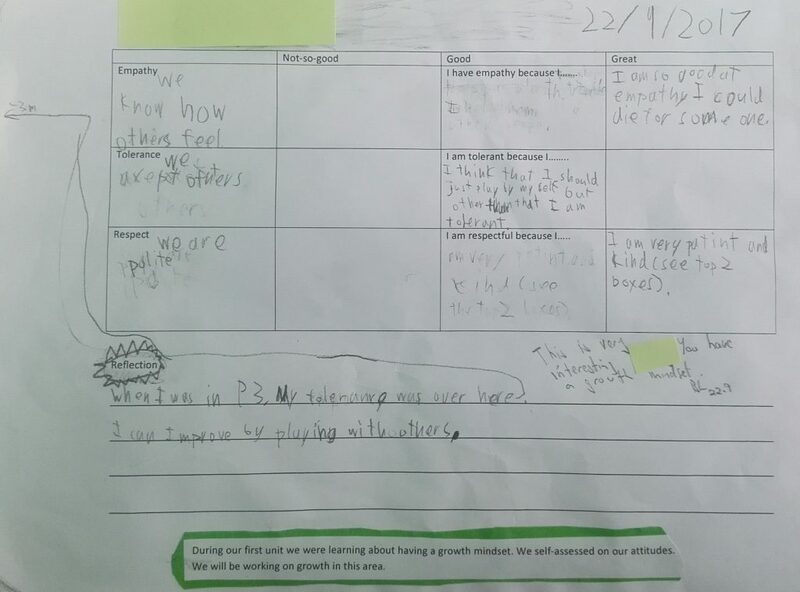 We were reflecting on tolerance and the student filled in the middle section of the rubric, thus displaying that he needs to grow in this area but is doing okay. I leave a few lines at the bottom to allow for further reflection and in this case the student drew a line off the rubric in the negative direction. He wrote, “In P3 my tolerance was over here”. This to me was an excellent example of how he is growing in the area of tolerance and can reflect on it. There were a number of other examples of students being honest in their self-assessment and giving themselves low scores, and this gave me an excellent opportunity to share about having a growth mind-set and how we are all life-long learners. 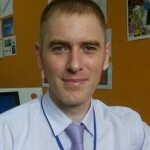 Brian Lalor is the Head of Primary at Xi’an Hi-Tech International School in China. He has been teaching internationally for the past 14 years. Brian loves learning and connecting with educators worldwide. Follow Brian on Twitter @brianlalor. Thank you! Yes it really did and reading your comment has encouraged me to follow up with this student! Leave a Reply to Brian Lalor Click here to cancel reply.